to bring the blessings of its timeless and universal wisdom into the mainstream of women’s lives, fulfilling the innate desire to enjoy fullness of life in the state of enlightenment—full realization of our infinite cosmic potential. to nourish and support the growth, happiness, and well-being of all our dear ones, near and far, and create a powerful momentum toward a permanent state of peace within our whole world family. These are the goals we cherish in undertaking this historic phenomenon of conducting an on-going course of study on the Bhagavad-Gita with women throughout the world. We warmly invite you to join us! Join anytime from the comfort of your own home! The course consists of two classes per month; each class is one hour in length and is made accessible online. The knowledge imparted in the Gita is both sequential and holistic, and can be entered into at any point in the text. The course is conducted in English, but is open to women from all countries. Please see short samples of the knowledge featured in the videos to the right. The course consists of two classes per month; each class is one hour in length. As we are engaged in an in-depth study of the Gita and its practical application in life, we typically cover one or two verses per class. This allows sufficient time to explore cross-references to earlier and later portions of the text and to enjoy supplementary readings from other literature expressing related points. The audio recording of each class can be accessed online beginning the second and fourth Sunday of the month. On registering for the course, you will receive a link by e-mail to access the class, which can then be heard any time at your own convenience. You can enter this ongoing course at any time, as well as discontinue, or take a break, at any time. The knowledge imparted in the Gita is both sequential and holistic, and can be entered into at any point in the text. 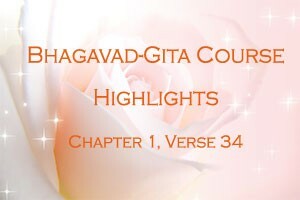 Course participants report that in experiencing each verse and commentary, they often receive just the knowledge they need at that particular time in their life – such is the magic of the universal wisdom of the Gita! This exercise is purely optional, yet highly recommended: On hearing the verses and commentaries during the class or when reading them on their own, course participants are encouraged to take note of those points or passages in the text that they find most valuable and that resonate deeply with their experience of life – those ‘aha’ moments that delight and inspire the heart and mind and infuse daily life with added joy! This 3 minute talk features a taste of the depth of knowledge contained in the Bhagavad-Gita Preface. Enjoy the nectar of the Bhagavad-Gita for bringing enlightenment, success and world peace.